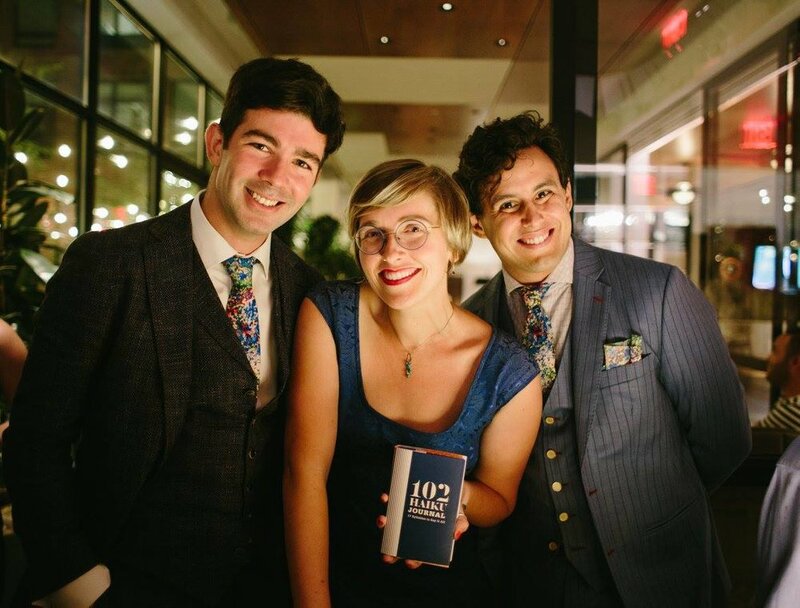 The Haiku Guys + Gals, co-founded by Lisa Ann (L.A.) Markuson, Erick Szentmiklosy, and Daniel Zaltsman in New York, is a company that provides an interactive haiku poem experience at events. Each haiku is tailored for the specific audience and written on a typewriter within a few minutes. They also host Haiku Duel, an experimental live haiku competition in New York and Los Angeles, as well as Haiku Feud, a bi-weekly online competition. What is your background before co-founding The Haiku Guys + Gals? Daniel Zaltsman: I was born in St Petersburg in Russia. I met Erick in college at Mount Claire State University in New Jersey. He was studying philosophy, and I was studying sociology, and we both loved spending time thinking and sharing ideas. Around the time we saw a lot of new startups, so we wanted to start a movement to inspire people to start. In that process, we started going out on the streets in Brooklyn and writing haikus. I am currently working full time in the technology industry, which is something I’ve always been passionate about. I was in DC and about to quit grad school. I was studying international relations, but I realized that I basically hated the government and rules, and I couldn’t work in that structure. So I started doing freelance work on a lot of art and creative events. I was trying everything to see what fit. I started writing haiku on typewriters with my friends as entertainment for a party at a sushi restaurant. One day I hitchhiked to a yoga festival called Wanderlust in Vermont and met Erick and Dan there. It was their first hired gig writing haiku on typewriters, and I got there and saw them and was thinking, “No way they are doing the same thing that I was doing!” We became best friends immediately, and I hung out with them the entire weekend and hitchhiked with them back to New York (let’s face it - I didn’t know how I was getting home otherwise). After we got back, I started helping them out with what they were doing. I found an excuse to move to New York and worked for a bike tour company. We were all doing the haiku hustle on the side. It was a matter of experimenting with the magic of ephemeral interactive experience. We want to inspire people and open up their curiosity. Erick has the best phrase about that: This experience is a photo booth for your soul. “Poetry DJs” is another really helpful way of describing it. We have the quality of the actual work but also the totally revolutionary approach and the entertaining element. The need it fills is the need for genuine interaction, and a need for a break from a screen, and a need for some sort of exchange where there is no string attached. Everyone feels they or their data are being sold all the time. We are not selling anything to each other in the moment. I look at you and you look at me, and I care about you and want to give you an artwork as a gift, free of charge. I’m not going to make you sign a petition afterwards. This is just you, and me, and art. Sarah Serrano: It is a very cathartic experience. We are just two souls where we take away all technology and social media. There is this need for human connection. How did you come up with the name The Haiku Guys + Gals? At first we were called Poetry at Parties. We were thinking, “What do we do? We provide poetry at parties.” Then everyone started referring us as the haiku guys and gals. So we decided make it easy and name our company The Haiku Guys + Gals. How did you get booked at events? Erick and Dan started doing it for free on the street, and they got booked at the festival where we met because the founder was jogging and saw them and asked them to come. I myself was actually asked by a corporate client to do a poetry activation and realized the potential. The first event that we all did together was through friends of friends and people who got a poem from us. How did you come up with the idea of Haiku Duel? Daniel Zaltsman: Erick and I came up with Haiku Duel when we were driving on the road. We wanted to take the haiku experience to a party setting, make it competitive and fun and something people have never seen. We now have Haiku Duel in New York and Los Angeles. It’s also bilingual in both English and Spanish here in NYC. The Haiku Duel is the perfect way for people who are not quite the poetry fan to get a dose of poetry and experience poetry in the most light-hearted way. No one gets bored at The Haiku Duel. How did you come up with the idea of Haiku Feud? It’s rather a business idea than a creative idea. We have this small but engaged following on Instagram. We wanted to do something fun to engage with them instead of just posting pictures of our haiku. People love competitions. There’s something about going head to head that people get so excited about. It’s fantasizing about the feeling of winning and a chance to be recognized for legitimate good creative work. We decided to put topics online, and we ended up getting great responses. We’re getting 100+ submissions online each time, and many more voting for the winner - It just deepens the connections and allows us to introduce poetry to people’s lives. How did you come up with the idea of Haiga? It’s relatively new for us. Haiga a traditional Japanese art form. It’s essentially a poem plus a picture. I worked on a project this fall and winter called #PoemsForSenators where I was sharing a poem dedicated to a US senator every single day. I started illustrating my own poems because they were so depressing sometimes. Then people started responding really well with them. When we have an idea, we always try it out. We also have many internal talents. Sarah is a really amazing artist, so she started illustrating her own poems when she performs. We also have relationships in this flourishing artistic community with people who specialize in illustration. We have one person in New York whom we just adore working with, Matt Long. From a business perspective offering, it’s great to add something even more excellent, valuable, and keepsake for the guest. It takes the soul of the poem and actually illuminates that through design and illustration. How did you come up with the book 102 Haiku Journal: 17 Syllables to Say It All? The publisher Abrams actually pitched us. They wanted to do a haiku concept, one of them had received a haiku, and they just Googled around till they found us. They paired us up with an in-house Japanese designer who did all the design. The exposed binding is traditional Japanese style, so every page lies perfectly flat. And inside the book jacket are seasonal haikus. It’s like a secret artwork inside of the book. Our book explains more about the philosophy and actual form of haiku. For months we put all our ideas together in a Google Doc. When we were eight months pregnant with the idea and thought we were ready to go, we went away to this AirBnB farm in upstate New York. The three of us stayed in a cabin in the woods and just looked at horses and wrote for 36 hours straight. The number 102 is just a pragmatic thing. We want to name the book with a number because it shows up on top of a list. That’s a strategic thing. “102 Haiku” also just rhymes and rolls off the tongue very well. How did you guys find the haikuists? There is a unique story with everyone. There are a lot of people reaching out to us. Everyone is an independent contractor. We don’t have any full time people now other than myself, but we are growing and looking to bring on people full time in the future. We have a team in almost every major American city as well as some other cities in the world - Paris, Montreal, etc. We want poets who have a specific area of expertise in terms of what their knowledge is and cultural background is. We have a really diverse team. Sarah Serrano: They found me through Anthony McPherson who is another haikuist and slam champion. I recited poetry at the Chilean embassy for an event they curated, and from there I jump started my journey with The Haiku Guys + Gals. How did you guys ensure the quality? Daniel Zaltsman: Lisa runs a boot camp! It’s very high intensity. Not that many people make it through. Now, we get so many inquiries, but there are so few people who are a good fit. You have to be a really specific person. You have to be fast because people have a short attention span. You have to be confident and interpersonal. You also have to be a decent writer. The caliber of the writing is actually a lower priority because as long as you are genuine and not dripping with clichés and misspellings, you will resonate with the person. You also get better at it with practice. It’s a learning curve. I never thought I’d be an expert at improv poetry, but here I am. How do you staff the haikuists at different events? When an event is confirmed on the calendar, Parker checks in with the poets to see who’s free and interested and who’ll be the best poets for the event. For example, there are specific events where they want people who speak a certain language. We have events almost every day, somewhere in the world. Sometimes we have to travel, which we love! We’ll go anywhere poetry is needed, which is everywhere. Parker Voss: We obviously look for the poet who is great for the job, but also availability is always uncertain, so it’s my task to make sure that everyone is aware of what the needs are. It’s good for the poets to stay in the community. How do you generate revenues and sustain your business? The main revenue streams are from people paying us at events. We have a high standard for payment to our poets. We pay based on the hours they perform. Then we also get special commissions for work. We are extremely frugal and careful about how much we spend but also spend at the right moment without being afraid. We don’t have a standard office space, so the typewriters are our biggest assets for sure. We don’t buy our poets equipment as a rule, they use our typewriters, but some of our more passionate poets such as Sarah and Parker have purchased their own machines because they want ones that speak to them. How do you determine how much to charge your clients? Daniel Zaltsman: We do a lot of different events. It’s not just one size fits all. Lisa Ann would jump on the call with someone and figure out their budget and needs. We are slowly raising our rates as we get better and better, and have more to offer, and more demand. When we first started, we don’t know how much people would pay us. When people can’t meet us at the right price, and it’s just not feasible for us, we have to say no. We always try to at least send them a poem to say thank you. How are your marketing strategies? When you make a relationship with an event planner, especially for corporate and wedding events, and they see the way people are enjoying what we do, and see how professional we are, they want to book us again. We have relationships with many event planning companies. We also target these communities by attending their events and conferences, bringing our typewriters when we’re out and about. We’ve done a few trade shows and some outreach, but mostly people just have a great experience and then spread the word. Daniel Zaltsman: The feedback is so quick with what we do. Just having these conversations made us feel more confident about this strange artform and business model and think this could actually work. We are also always generating ideas. We each come to meetings with 10 ideas and have a quick brainstorming session when we’re ready to tackle something new. Don’t be afraid to even try something, even though it seems crazy. Some people could not believe how we are a company of haikuists on typewriters. If you find your niche and find something that solves a problem and creates a tangible response in the world, run with it. Daniel Zaltsman: Put yourself out there. And when you see people putting themselves out there, embrace those people. When we were at that festival in Vermont, Lisa Ann didn’t leave us at all, she embraced us. Be mindful and understand the people you work with.